..but I hear they're short of a few at the moment, so if you fancy your own wings then apply here. the first and only beginner's guide to teach how to connect with your inner wisdom, has been receiving rave reviews and now we are bringing this wonderful work to you. A lot of books talk about intuition, it's power and it's importance, but this is the first to teach how to connect with it so that people can lead a truly fulfilled life. I've been thinking about how technology can serve as a resource on our spiritual journey. One example is, of course, the internet. I see it as a map to journey on and this site as a place where people can offers paths and signpost to sites that they have found helpful in their spiritual journey. Right...I'm off to tribal gathering for a techoshamanic experience! at the dekhomai stand at the london mind body spirit festival one of the things we have been running is a laptop computer with a few items of digital spirituality - we've called it iSpirituality. this may be a weird concept - i haven't seen any other stands doing anything quite like it. 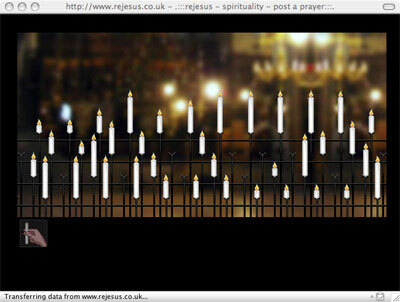 it took me by surprise the first time i cam across the idea of praying by lighting a virtual candle on a computer screen - i thought it would be naff but actually it really seemed to work - if all of life is endued with the presence of God then why not have a sacred moment at the computer? i'll start a category on the dekhomai blog of digital spirituality to post up stuff we come across. first up one of the items on the stand - lavalamp prayer. i love this - it's so seventies! it's online and free just follow the link. when you click on a bubble a window opens in which you type your prayer. clicking amen then returns the bubble to the lamp where your prayer floats upwards until it's reunited with the oneness of the lava. you can also minimise the lamp so it is just there in the corner of your screen. cool eh?